With twelve million viewers watching as a Fiat 500c took center stage during a Jennifer Lopez performance on the American Music Awards, there is no denying the Lopez / Fiat collaboration has garnered a lot of interest. Naturally, with all this attention, the haters on the Internet have had to manufacture some kind of controversy to justify their existence. What they managed to come up with is a stretch even for the most unabashed mudslinger. The supposed affront centers on Lopez not being the one driving the car in her Fiat commercial. The commercial, labeled as a dramatization, features Lopez talking about her affection for the Bronx while she is driving a Fiat 500c through the streets of the borough. To accommodate Lopez's schedule, the shots of the drive around the New York locations were filmed by a stand-in, while Lopez filmed the others in LA. This is common practice in TV make believe land, however, this is just enough fodder for media types with ulterior motives to express feigned outrage that Ms.Lopez didn't spend a day flying across the country to film a 60 second drive around the block. That there are naive people out there paying attention to this is not too surprising in itself, but for the "mainstream" news outlets to actually pick up and devote time to this non-story is pretty ridiculous. Man, things must be slow in the news business. Thankfully, clear thinkers and journalists like Anderson Cooper see through the smoke screen. The Fiat Store is stocked with chic Fiat 500 merchandise. Order now and show the world you have good taste. 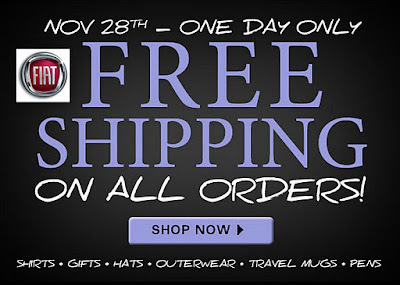 It's Cyber Monday, and you just got done buying cool gifts for other people, well now it's your turn. 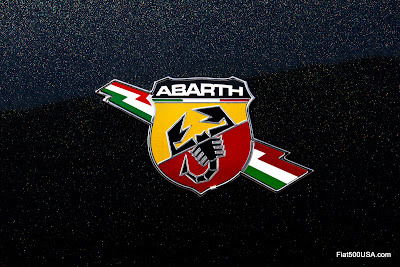 The Fiat and Abarth online stores have announced Cyber Monday deals. The Fiat Store is offering free shipping, and the Abarth Store is discounting, so drop what you're doing, and check them out. The US Fiat 500 Abarth is due out in March, but that doesn't mean you have to wait to stock up on some Abarth swag. You know you want all this stuff, so do it while it is on sale. 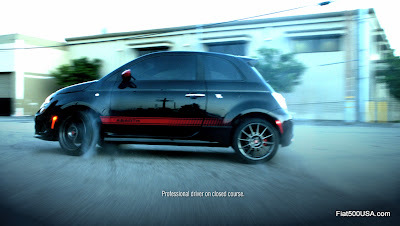 Auburn Hills, Mich. , Nov 16, 2011 - The aggressive styling of the new 2012 Fiat 500 Abarth embodies the Abarth brand tradition in full – purposeful and intentional details all designed to improve the car’s performance, while enhancing the clean and simple design language of the Cinquecento. 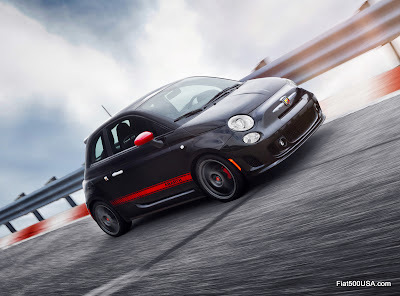 The new 2012 Fiat 500 Abarth takes the city-friendly proportions and iconic Cinquecento cues of the new Fiat 500 hatchback model further, with a stylistic approach to exterior aerodynamics and highperformance functionality. 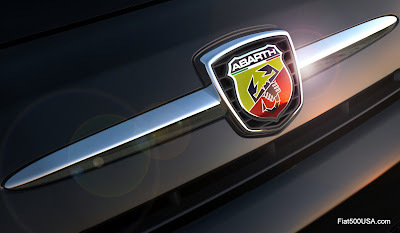 To improve aerodynamics — while creating the necessary engine compartment space for the all-new 1.4-liter MultiAir® Turbo engine — the Fiat 500 Abarth’s front fascia is more pronounced and pushed 2.7 inches (69 mm) ahead of its signature “whiskers and logo” face, recalling the Abarth stylistic treatments from vintage 850 TC and 1000 TC models. Continuing the Fiat 500 Abarth’s unique front aerodynamic design treatment, the signature “Abarth” shield floats on a finned surface that serves as an additional air intake. 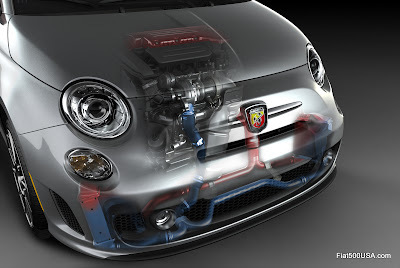 Below, the “triptych” of air intakes consists of three inlets with broader openings than the Fiat 500. For a more aggressive look, a blacked-out fascia accent integrates projector-beam fog lamps and helps direct air for engine cooling. Twin “nostrils” are precisely positioned on the front fascia to maximize airflow in and out of the two engine intercoolers (both intercoolers are visible through the “nostril” inlets). 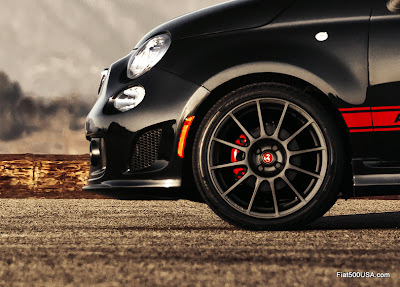 More aggressive Abarth-designed side skirts provide a vertical and athletic profile, while highlighting the iconic curves of the Fiat 500 Abarth. 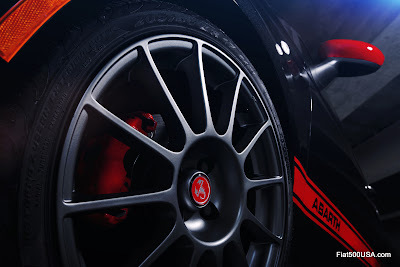 Abarth-designed 16-inch cast-aluminum wheels, or optional 17-inch lightweight forged-aluminum wheels, fill the flared wheel arches and provide ventilation for the performance brake system. 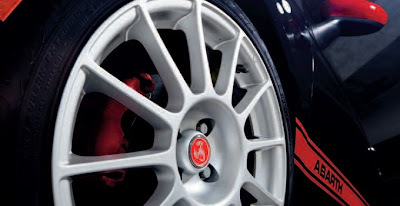 In addition, both wheel designs allow visibility of the lacquered Rosso (red) brake calipers. 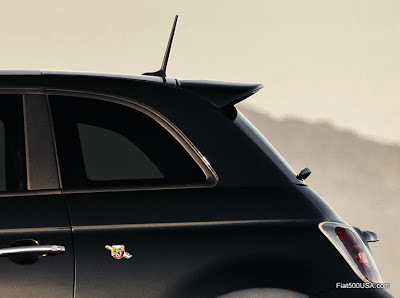 From the rear, a large liftgate-mounted spoiler extends the roofline of the Fiat 500 Abarth and improves the vehicle’s aerodynamic behavior by creating additional down force. 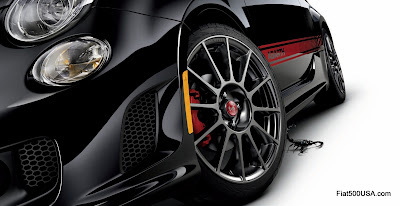 Below, the two-piece Abarth-styled rear fascia accentuates the road-holding stance of this high-performance 500 and optimizes airflow output with its black-accented rear diffuser. In addition, symmetric, twin exhaust cutouts deliver a powerful look, while large concentric “double tip” exhausts provide a tuned sound and Abarth-exclusive look. Paying homage to the brand’s racing heritage and vintage Cinquecento-based 595 and 695 Abarth models, iconic Abarth shields are once again positioned on both driver and passenger rear-quarter panels and feature a “shot through” Rosso-Bianco-Verde (red-white-green) tri-color arrow. For even more Abarth style, optional bodyside exterior decals pay homage to the historic models and provide the new 2012 Fiat 500 Abarth with a track-ready look. Available in Rosso, Nero and Bianco, the signature Abarth triple-stripe logo runs horizontally along the lower bodyside and dissipates into a gradient rearward. Rosso, Nero or Bianco exterior mirror caps also are included to match the stripe. 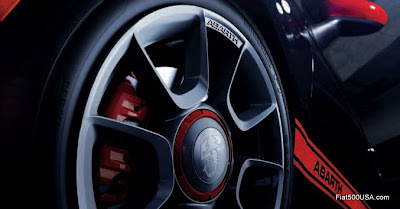 For maximum customization, the Abarth-designed 17-inch forged-aluminum wheels are available in Hyper Black or optional Bianco paint. Expanding on the no-nonsense design and high attention to detail found on the 2012 Fiat 500, the new Fiat 500 Abarth features a performance-designed cockpit with unique appointments. For easier operation, and to keep the driver’s eyes on the road ahead, the Fiat 500 Abarth’s steering wheel includes cruise, audio and BLUE&ME™ Handsfree Communication technology controls. 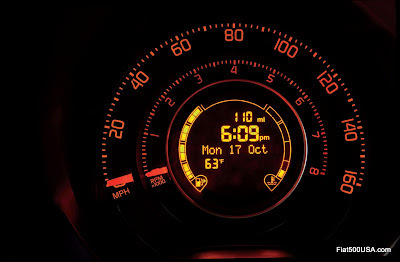 Behind the steering wheel, the Fiat 500 Abarth features a large concentric instrument cluster with 160-mph speedometer, tachometer and trip computer. For a touch of sophistication, the instrument-panel cluster brow is wrapped in Nero leather with Rosso accent stitching. 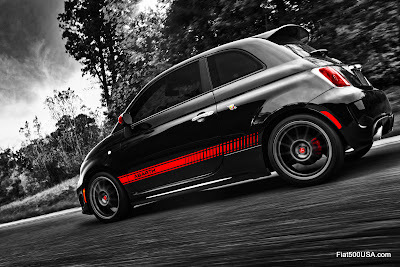 Unique to the Fiat 500 Abarth is the addition of an analog turbo-boost gauge with integrated LED shift light in the center that illuminates to optimize gear changes. Integrating the latest in portable vehicle navigation on top of the instrument panel, the available TomTom® navigation with BLUE&ME™ Handsfree Communication technology features a 4.3-inch touchscreen display. Below the instrument panel, Abarth-designed aluminum pedal covers feature Nero rubber trim for a decidedly racing look, while the Nero leather shift knob with Rosso accent stitching provides a precise feel of the shifter. Unique Abarth-styled front performance seats feature a one-piece design with large side bolsters, racing-harness pass through, accent stitching around the perimeter and integrated side-thorax air bags. The Fiat 500 Abarth’s rear seat is designed to be comfortable for two adults and delivers the high-quality, comfort and craftsmanship executed on the front seats. To highlight that this hatchback is roomy, the rear passengers’ upper seatbacks are raised and bolstered for added back support. 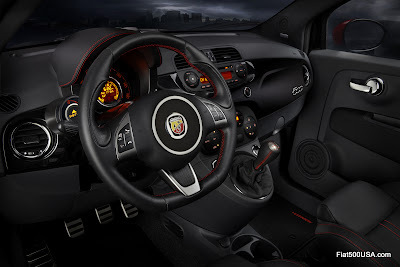 For a contemporary and technical look, the Fiat 500 Abarth features the center stack, radio and climate control system, as well as the headliner and pillars finished in Nero, while the four-passenger seating is available in Nero (cloth or leather) or Rosso/Nero (leather) color combinations. 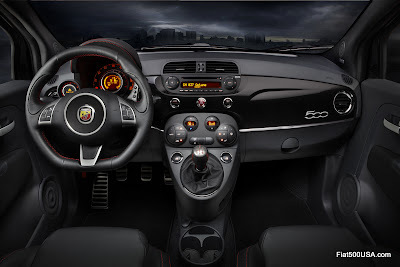 Thanks to careful analysis of the interior space, designers of the new 2012 Fiat 500 Abarth made an amazingly roomy and capable cabin within its city-friendly size. With built-in storage spaces, including two in the instrument panel, map pockets in the door panels and another below the center console’s shifter bezel, this high-performance Cinquecento can quickly and conveniently store mobile devices and travel gear. In addition, the luggage compartment is spacious, providing a maximum of 26.8 cubic feet for gear with the rear seats folded. Well, it's Black Friday but you slept in and didn't make the 5AM sales, that's OK, you didn't need that stuff anyway. 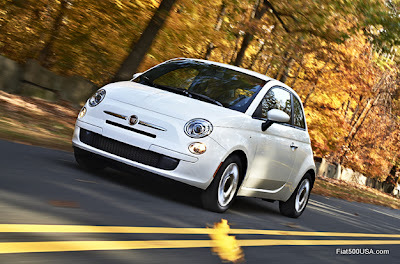 What you really want is a new car and Fiat has some deals that will salvage your day. The good news is that this isn't just a Black Friday deal, so don't worry if you can't make it today, but this offer will be expiring soon - take advantage of it! 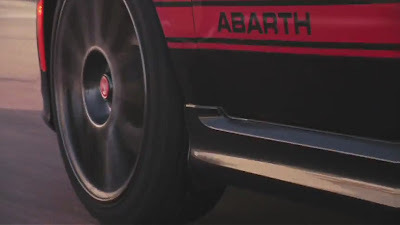 The debut video ad for the 2012 Fiat 500 Abarth hit YouTube last week and within this short time gathered more than 1 million views! The ad called "Seduction", has gotten attention from all around the world and features the menacing Fiat 500 Abarth and Romanian model Catrinel Menghi. The “Seduction” digital spot was created in partnership with The Richards Group. If you are going to the LA Auto Show this week to see the new US Fiat 500 Abarth, make sure you stop by the 500 Madness display. Boris and Rachel from 500 Madness have put together a fantastic display highlighting just some of the upgrades you can do to a Fiat 500. 500 Madness modified this Fiat 500 Sport with some tasteful upgrades. 500 Madness has a carbon fiber dash for the Fiat 500. It features a gloss finish and looks striking. 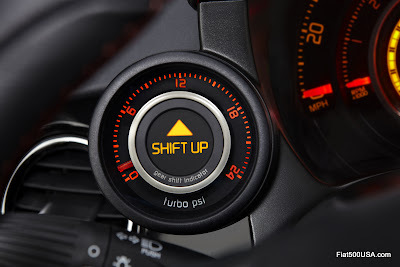 Shift knob, shift boot and peddles by the Italian company Black add the perfect touches. Magneti Marelli wheels with 500 Madness lowering springs. ...put the cap back on. It can't get any easier than that! 500 Madness has a wide body kit installed on this US Fiat 500c. The kit is very high quality and is guaranteed to transform your Fiat 500 into a head turner. 500 Madness bought a Fiat 500 Prima Edizione as soon as they came out in order to begin test fitting components made specifically for the US Fiat 500. 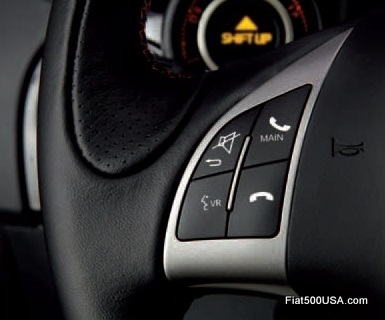 500 Madness works closely with Fiat Studios so accessories can be installed right at the dealership. This Fiat 500 Pop is an example of what can be done in a day or so. The tasteful upgrades include wheels and lowering springs. Shift knob with matching shift boot and handbrake cover personalize this Fiat 500 Pop, turning it into a unique, eye catching ride. Make sure you stop by the 500 Madness booth and talk about what can be done to your Fiat 500! 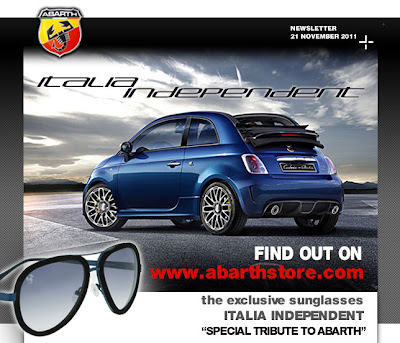 While you are waiting for the US Fiat 500 Abarth to be available sometime in March, make sure you go to the official Fiat Abarth Merchandise store and look through all the fabulous accessories available. Don't forget to sign up for the updates and specials! Jimmy Kimmel Live! is broadcast on ABC weeknights at 12 a.m EST. 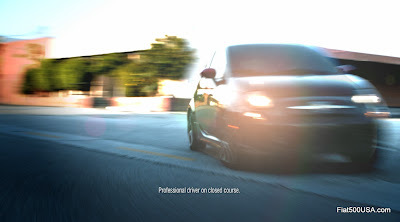 Look for the 2012 Fiat 500 Abarth at your nearest Fiat Studio in March 2012. Monday, Chrysler named a new Head of the Fiat Brand for North America. Timothy Kuniskis takes over for Laura Soave, who left the Company to pursue other opportunities. 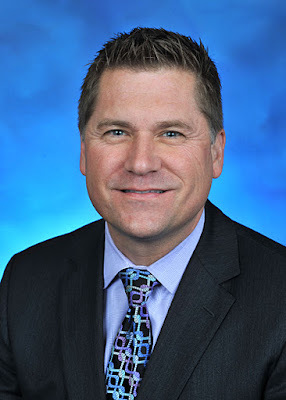 Kuniskis is a veteran Chrysler employee with a strong background in dealer operations and marketing. Kuniskis most recently served as Director for both the Chrysler Brand and Fiat Brand Product Marketing. We look forward to Tim Kuniskis' leadership in these areas as Fiat USA has finally reached its goals of having 130 Fiat Studios opened in the United States. Finally, on behalf of her many fans that visit this site, I would like to publicly thank Laura Soave for all her hard work in re-establishing the Fiat Brand back into the United States. I would also like to thank her personally for her graciousness and thoughtfulness and wish her the very best in her future endeavours. The 12 million viewers of last night's American Music Awards were treated to a view of the Fiat 500 during a performance of Jennifer Lopez's hit 'Papi'. 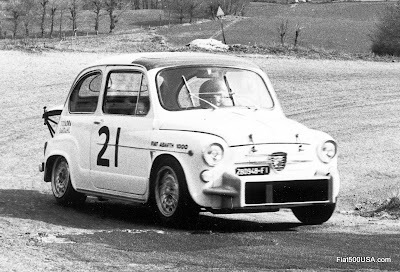 Lopez's spectacular stage show prominently featured the Fiat 500 - exposing it to a huge demographic. It couldn't get any better than that. Additionally, the new commercial for the Fiat 500 by Gucci was aired, topping off a great night for Fiat USA. The Fiat display at the 2011 Los Angeles Auto Show is striking and shouldn't be missed. On display, of course, is the new 2012 US Fiat 500 Abarth plus the Fiat 500 Gucci and the Fiat 500 Carbon edition SEMA show car. The 2011 Los Angeles Auto Show runs from November 18 through November 27, so there is still time to check out the new Fiat 500 Abarth and all the other lovely things at the show. If you can't make the show, I've included at the end of this post a slideshow with 70 pictures taken at the Fiat booth.